Hey everyone! I decided to make a fun series called "Dorm Delights" where I'll share fun recipes you can easily make in your dorm by using a microwave, or any easily accessible appliance! 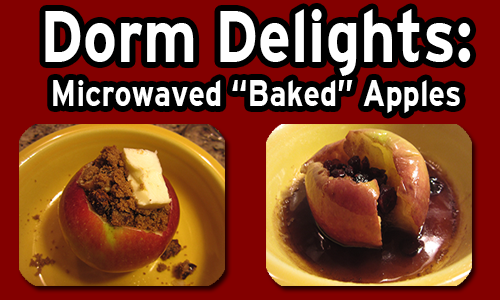 The first video of the series is the Dorm Delights: Microwave "Baked" Apples! Mix all of the dry ingredients and half of the butter together and place in apple. Then top with other half of butter. Or top with whipped cream and pour the melted liquid on top... YUM! Let me know if you try it out... not only does it taste amazing, but your dorm will also smell heavenly! Now this is something I could try out with the new microwave oven I've got last month. It looks and taste interesting, I wonder what does it taste like. I'll definitely cook this one. This additionally lessens the requirement for the ventilation system to be running to such an extent.microwave Oven toasters is another name for toaster ovens.